Coffee cup reading is a way of fortune telling performed in numerous Mediterranean and Middle Eastern countries. In other parts of the world similar rituals are performed but instead of coffee grounds they involve reading patterns in tea leaves or wine sediments. 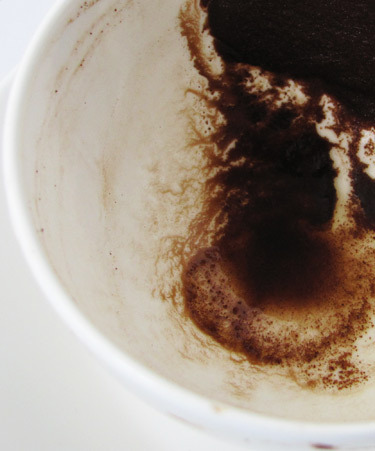 These kinds of readings are also known as Tasseography, Tasseomancy or Tassology. The actual ritual of reading is performed differently throughout the world and the interpretations of various symbols can vary greatly. Traditionally coffee that is used for reading needs to have grinds that sit at the bottom of the cup after most of the liquid is drunk. It is often believed that the drinkers of coffee should not read their own cup. For this little project, initially we photographed four cups and sent the photos to a number of people in 6 different countries, some of whom were familiar with the coffee cup reading rituals, some were not even aware of the fact that such a tradition existed. We were extremly pleased with what arrived back to us. The readings were often poetic, sometimes humorous, in any case definitely worth sharing. We hope you'll enjoy them as much as we did.